Everything about the album is awesome!!!!!!!! Love it! It was also packaged well for shipping. My son is an avid listener of ALL genres of music. So much so that he produces his own college radio show titled "The Shuffle with Brent Bigelow" (@TheShuffleYSU) for the last 2 years; on Rookery Radio at Youngstown Sate University. Where he plays Chris Stapleton quite often; as one of his favorite artists! And because of Brent's LOVE of music he collects vinyl records. Therefore, Chris + vinyls = an AWESOME gift for my 22 year old MUSIC LOVER!! Thank you for your music, Mr. Stapleton. Brent really enjoys your albums!!! Bought this as a gift for a friend. She loves it. If this man's voice doesn't bring a tear to your eye, you simply aren't human. This album is a classic and an absolute must for vinyl collectors. God Bless the LEGEND Chris Stapleton. My friend and I were at the Cary, NC show and she collects vinyl albums for a wall of album covers that she has in her home. After the show, she was disappointed that she forgot to get one. So I ordered her one and she loves it. I can't wait to go see Chris' Traveler album on her wall. In my opinion, everything sounds better on vinyl and I didn't even consider buying the CD. This album is incredible and the sound quality on vinyl is amazing - just as I remember hearing Chris perform live in a small winery cave in the Napa Valley. If you are looking to start collecting vinyl, this is a great place to start - highly recommended. Got the vinyl. Best album I've purchased in quite a while. Wish it came with a free download of the album like most do. 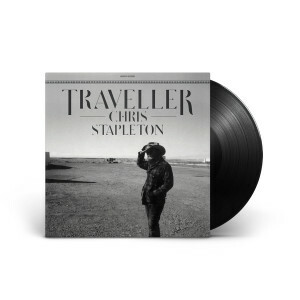 I saw Chris Stapleton on the CMAs and was immediately hooked! The songs on this record are all so good. It's great to see real country music returning.